Rear Adm. Patrick Piercey, a much-traveled Navy officer, is moving from Stuttgart to San Diego to become the latest in a recent series of commanders of Carrier Strike Group Nine based here. Secretary of the Navy Ray Mabus and Chief of Naval Operations Adm. Jonathan W. Greenert announced Piercey’s new assignment Tuesday. He will be at least the fifth commander of the Reagan-led strike group in the past four years, following rear admirals Patrick Hall, Troy Shoemaker, Mark Guadagnini and Scott Swift, according to online references and a Navy spokesman. 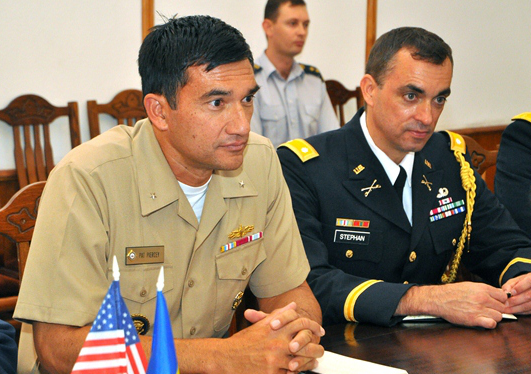 Piercey is currently serving as deputy director for plans and policy, ECJ-5, U.S. European Command, in Stuttgart, Germany, the Navy said. A native of Clinton, Okla., Piercey was commissioned in 1985. He was nominated to appointment to rear admiral (lower half) in May 2012. His sea assignments included commanding officer and executive officer, USS Bunker Hill; reactor officer, USS John C. Stennis; commanding officer, USS Howard; engineer officer, 1st lieutenant and auxiliaries division officer, USS Mississippi; and, combat systems officer and weapons officer, USS Thomas S. Gates. His shore assignments included policy planner, Office of the Chief of Naval Operations, Strategy and Concepts Branch; White House fellow and special assistant to the deputy director, White House Office of Management and Budget; policy planner, The Joint Staff, Directorate for Strategy and Policy, Space and Ballistic Missile Branch; and executive assistant to the assistant to the chairman of the Joint Chiefs of Staff. Piercey earned a bachelor of science in systems engineering at the U.S. Naval Academy and a master’s degree in military arts and science at the Army Command and General Staff College in Fort Leavenworth, Kansas. His biography site notes his awards, including Defense Meritorious Service Medal, Meritorious Service Medal (with four gold stars), the Navy and Marine Corps Commendation Medal (two gold stars) and the Navy and Marine Corps Achievement Medal. 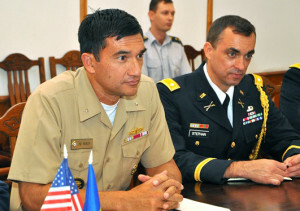 Piercey assumed duties as the deputy director of Plans, Policy and Strategy at the United States European Command in January 2013.